Before Leaving The Bar, A Chance To Breathalyze One company is selling breathalyzers to bars allowing patrons to self-test and see whether they've exceeded the legal limit. But some bar owners worry that patrons might decide to drink less if they see their blood alcohol level is too high. 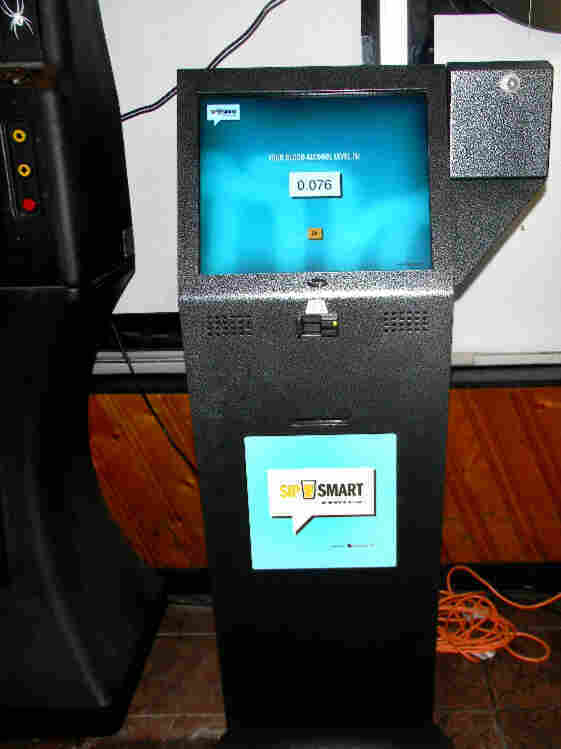 A new SipSmart kiosk awaits customers at Caputi's, a sports bar in suburban Buffalo, N.Y. Customers swipe a credit card and then blow into a plastic mouthpiece attached to the side of the machine. Seconds later, their blood-alcohol level flashes on the screen. Most people know 0.08 is the legal limit for driving under the influence of alcohol in the U.S., yet few know when they've hit it or what it feels like. Montag wants to change that by placing interactive Breathalyzer-type monitors in bars. So Ladybug Teknologies has designed a touch-screen device about the size of an ATM. Users pay $5 and receive a small plastic mouthpiece to attach to the machine. After blowing hard for 5 seconds, the screen flashes a user's blood alcohol level in large, bold numbers. Then, a coupon for a taxi company prints out. 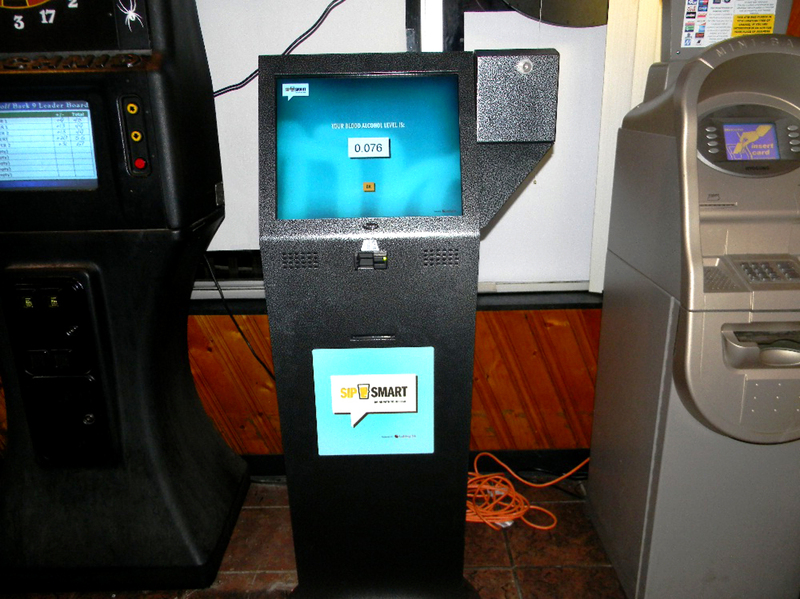 One of the machines, dubbed the SipSmart kiosk, recently made its debut at Caputi's, a bar in suburban Buffalo. It's the kind of place where most patrons drive home. "I don't know what exact 0.08 is, no. I don't know what that legal drunk limit is. I don't know what feeling that is or anything," says 21-year old James Wanglin, a regular here. He says his group usually has a designated driver, but many groups don't. Innovation Trail is a reporting collective that covers the economy, technology and innovation in upstate New York. "People think they're OK, and that's the problem — they aren't," Wanglin says. To guide Wanglin and others to the kiosk, Ladybug's Joe Rank works the crowd, wearing a backward baseball cap and a shirt that reads "Blow Me." Rank tries to inspire drinkers to work the blood-alcohol monitor into their routines. "We're going around [to help] promote, getting people toward the machine to actually use it and figure out what it is. Mostly, it sits there and not everyone really can tell what it is," he says. While some are too embarrassed to use it in a social setting, many young drinkers are naturally drawn to the machine, Rank says, for entertainment and gaming. "I see it more with the younger crowd; they're going see how high they can get their blood alcohol level," he says, "where an older crowd is going to use it ... for the more responsible way, to know that, 'Alright, I have to drive home. What [level] am I at?' "
I don't know what exact 0.08 is, no. ... I don't know what feeling that is or anything. But Ladybug doesn't want its readings to be taken as gospel. In fact, a legal disclaimer on the machine says it's just an educational tool. Ladybug CEO Sherry Colbourne says her company and bar owners assume no liability even if a user blows over the legal limit and still gets behind the wheel. "We're all grown adults, and certainly by the time you're allowed to drink, you're sufficiently mature enough to be able to understand the consequences of bad decision-making," Colbourne says. But using the machine requires some expertise. To provide an accurate sample, users must wait 15 minutes after their last drink. Intoxication levels constantly change, meaning you could be at 0.07 now but blow 0.09 just a few minutes later. Plus, Ladybug's Montag says she's had trouble placing the kiosks: Bar owners see them as a threat to their bottom line. "They fear that if people actually knew what their legal limit was and that they were over the 0.08 that they would actually in fact stop drinking sooner," Montag says. "The fear of that knowledge being out there is, they think that might hit their revenue." Soon, Ladybug will launch an app to send the monitor's results straight to a user's smartphone. It will even chart intoxication levels over time, so users can better associate a feeling with a number.